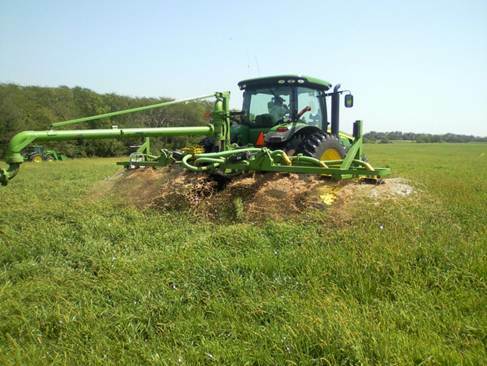 Is your farm ground getting compacted by manure tanks? Compaction has always been an issue in the farming business. I have a drag hose system for pumping manure that will not only decrease compaction, but also provide consistent nutrient flow to the root zone as a result of triple port agitation. Hi, my name is Steve Jochum. I am the owner/operator of Northwest Ag Systems which is a custom manure application business. 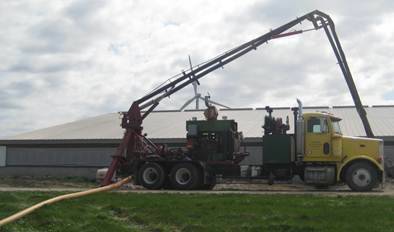 Our triple port agitation means that we are agitating the pits in three different locations while we are applying the manure directly from your pit through hoses to the application tractor in the field. Our over-the-axle swing tube mounted on a four wheel drive tractor allows us to make 180 degree turns on the ends in the fields. This enables us to have consistent coverage which eliminates the dry spots or yellow streaks in corn the following year. Our toolbar is set up with Dietrich shanks for minimum soil disturbance and up to 35 foot width for low application rates. 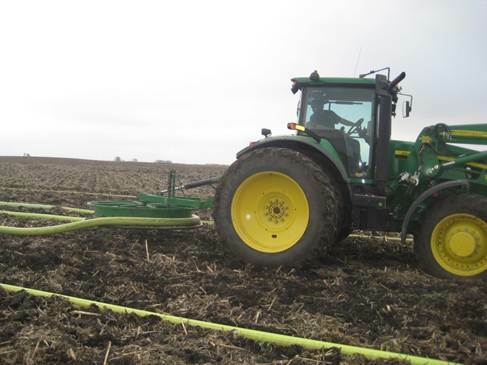 Northwest Ag Systems is a certified custom manure applicator in Iowa and Missouri. We are fully insured including workmen’s compensation. We are also members of Iowa Commercial Nutrient Applicators Association, Iowa Pork Producers Association, Iowa Cattlemens Association, and The Coalition to Support Iowa’s Farmers. I grew up on a farm in Northwest IA, raising hogs, sheep, and grain. After high school, I attended Iowa State University, and received my Bachelor’s Degree in Operations & Supply Chain Management. 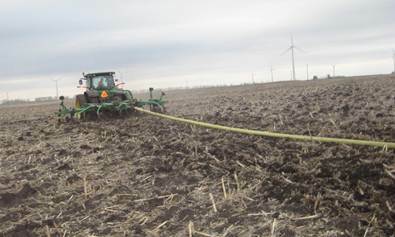 I spent 3 years working with my brother pumping manure, in that period of time I was able to work up to being in charge of my own crew and overseeing all aspects of the drag hose system including: monitoring agitation, completing manure application sheets, and collecting manure samples. This experience gave me the knowledge and confidence to start my own business. During 2010, I began purchasing equipment so I could start my own custom drag hose manure application business. For the last two years I have been pumping and applying manure in Iowa and Missouri. I have recently purchased an acreage north of Boone as my permanent residence and plan to build my business in this area.